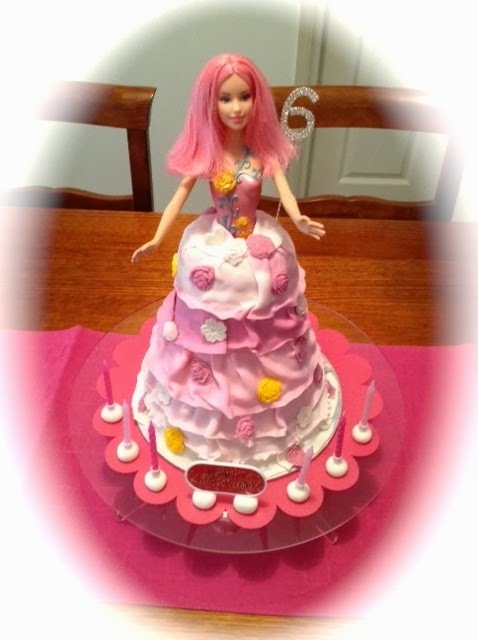 A Barbie cake was requested by my granddaughter Charlotte. She was to be 6 on January 1. She requested it have colours of pink, purple and white. Now I am an avid Op-shop shopper always searching for a bargain and it happened that I found a great Barbie with pink hair. When I got her home I gave her the full beauty treatment and she turned out to be the ideal centre star of the creation. The cake comprised six layers of butter cake coloured pink, vanilla and chocolate sandwiched with dark chocolate ganache and covered with white chocolate ganache. the layers of fondant are frilled around her. I loved making this cake - 'twas fun!